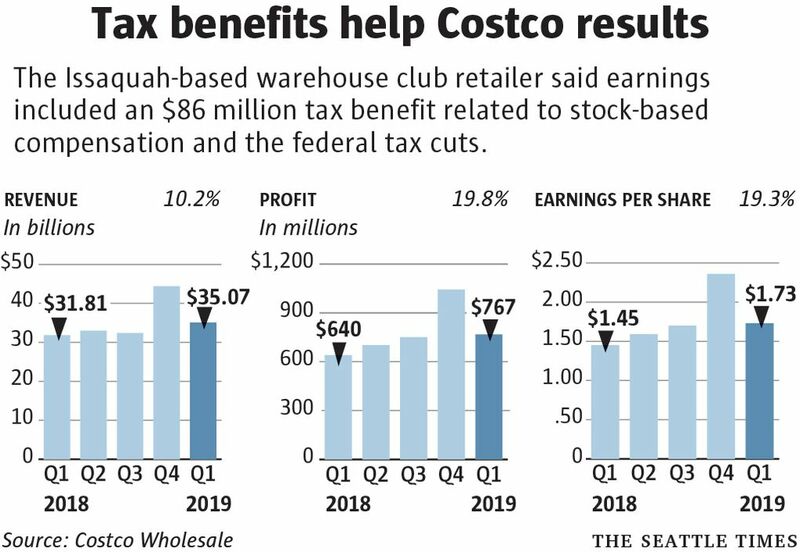 The warehouse club retailer remains a sales juggernaut, with $34.3 billion in fiscal 2019 first-quarter revenue, up 10.3 percent. At first glance, Costco’s latest quarterly earnings look like the kind of results that would be the envy of any young, fast-growing company. The 35-year-old Issaquah-based retailer grew sales 10.2 percent during its fiscal 2019 first quarter to $35.1 billion and inked a profit of $767 million, or $1.73 per share, up more than 19 percent. The median estimate of 23 financial analysts following the company was for earnings of $1.63 per share. But those same analysts peppered Costco Chief Financial Officer Richard Galanti with questions during a conference call Thursday about the company’s profit margins as it continues building up its online retail business. Costco shares were down 2.6 percent in after-hours trading Thursday. 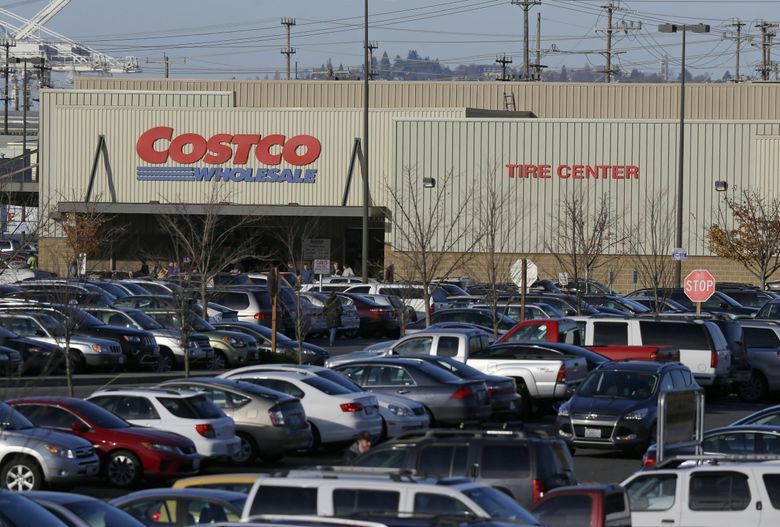 Costco’s gross margin in the quarter ended Nov. 25 was 10.75 percent, down from 11.25 percent a year earlier. That was despite comparable sales — sales at stores that have been open a year or more — rising a strong 7.5 percent, excluding gas-price changes, the foreign exchange impact and other items. Galanti said Costco’s management is less worried about small changes in the company’s gross margin — a measure of how much a company makes for each dollar of sales — while focusing more on investments that can drive the business in the long term and build loyalty. He said the company has boosted wages and is spending on information technology and its e-commerce capabilities, including fulfillment centers and depots. “We feel good. We’re building to accommodate more growth on the e-commerce, delivery side,” Galanti said, adding that he expects costs related to those efforts to come down over time and reminding analysts that Costco’s grocery-delivery program with Instacart is barely a year old. Costco is still learning how its fast-growing e-commerce operation — which saw sales rise 26.2 percent in the quarter — interacts with its main business of selling items from the 768 warehouse stores it operates in 11 countries. (It plans 23 net new locations in the current fiscal year, including its first in China, now under construction in Shanghai.) For example, the company is putting Amazon-style purchase lockers in 10 stores as an experiment to refine its buy-online, pickup-in-store offering. Galanti said the company just began selling Apple products online and is working on the logistics of bringing them into its stores, too. He added that Costco’s e-commerce business is not dramatically more profitable than its business as a whole. But Galanti also emphasized that the company’s margins — historically low and driven in large part by membership fees — were affected by lots of other moving pieces, including competitive pressure from supermarkets and Walmart unit Sam’s Club in its fresh produce and meats category. The company’s financial performance in the quarter was clouded by a couple of special items. It recorded a tax benefit of $86 million related to last year’s federal tax cuts and stock-based compensation. More than 5,000 Costco employees receive annual stock grants in October which amount to as much as 80 percent of their compensation, Galanti said. It also took a $43 million charge against earnings related to a credit-card rewards redemption program.